In a rustic wooden structure perched on the eastern bank of the Jordan River, Father Gianluigi Corti leads a group of Italian pilgrims in renewing their baptismal vows. The river is now little more than a muddy stream, drained over the years to meet the demands of the growing populations of the Holy Land. The air is still, apart from the singing of Italian hymns and a chorus of chirping insects. The latter is a constant sound in this dry, hot region of the Hashemite Kingdom of Jordan known as the Valley of Trickling Water, or Wadi el Kharrar in Arabic. As Father Corti concludes the simple renewal service, he dips a plastic bottle into a heavy stone basin filled with water from the river and slowly pours its contents on the heads of the pilgrims. As a parish priest, he has led many such tours to the Holy Land. A short walk from the pilgrims lie the remains of an early Christian church. Uncovered in the late 1990’s by a team of archaeologists led by Dr. Muhammad Waheeb, the ruins belong to a complex built at the end of the fifth century. They mark the site where early Christians believed Jesus was baptized — the same complex described in pilgrims’ accounts from the fifth to seventh centuries. Above the brush, not far from the river’s edge, rises the golden dome of a new church built on land donated by the Jordanian royal family. Dedicated to St. John the Baptist, the Orthodox shrine is the most prominent monument in an area long believed to be the biblical Bethany Beyond the Jordan, where John lived, preached and baptized his cousin, Jesus. It also stands as a reminder of the Hashemites — Jordan’s royals who descend from the prophet Muhammad — and their personal commitment to develop the kingdom’s holy places, Christian, Jewish and Muslim. Read more in On Jordan’s Bank in the January 2011 edition of ONE. "We Have the Blood of Martyrs Running in Our Veins"
The Winter 2015 edition of ONE includes a visit to Chaldeans who have settled in the American southwest. Journalist Joyce Coronel offers some personal reflections below. It was the most compelling quote I’d ever had in a long career in Catholic journalism. Those words, spoken in the wake of a deadly attack on a Catholic cathedral in Baghdad in late 2010, set me on a path that still unwinds before me. When CNEWA asked if I would write about the Chaldean Church in the western U.S., I knew I would finally get to see the eparchy’s headquarters located in El Cajon, California, a five-hour drive from where I live in Arizona. What I saw there in the course of writing the article for ONE was deeply inspiring. Two young men, eager to serve the church, stood before a packed cathedral and promised to spend their lives as priests. The church was jammed with the faithful, and clergy watched from around the altar. Among them were two young priests ordained last spring as well as Chorbishop Monsignor Felix Shabi, better known around the eparchy simply as Father Felix. A canon lawyer, he speaks five languages and is devoted to serving his people. Father Felix leads the Chaldean Catholic vicariate in Arizona and it is he who spoke those words of martyrdom to me five years ago, explaining that the Chaldean church has endured nearly 2,000 years of persecution. His own cousin, Father Ragheed Ganni, was martyred for the faith in Mosul in 2007. As he told me of the plight of his people on that fateful day in 2010, the aroma of Chaldean cuisine filled the air. No one had ever invited me to stay for lunch after an interview! Food, I now realize, is integral to the Chaldean identity. To meet and not break bread is anathema. Standing inside the Good Old Days Spices shop on Main Street in El Cajon, it was easy to see the blending of faith, family and food that characterize the Chaldean culture. Nancy Delly runs the store along with her husband, Wisam. The family has been in business 30 years. Behind the counter are large statues of the Virgin Mary as well as various saints, along with strings of rosary beads. There’s also a giant photo of her cousin, the late Patriarch Mar Emanuel III Delly, just over the display of Middle Eastern teas, kabob sticks and cans of fava beans. As Nancy rings up customers’ purchases, she tells them, “Thank you. God will bless you.” But does she miss the old country? It’s all about family here. I asked Raad Delly, president of the parish council at Mar Abraham Chaldean Church in Arizona, about the close-knit community. It seems to me that everyone is related. How many cousins does he have in the U.S. anyway? In the streets and shops and restaurants as well as the church, it’s not uncommon to see older women, dressed in their native attire of long, simple dresses, their heads covered in a close-fitting cap. Many of these elderly Chaldean immigrants have spent a lifetime in villages where they walked to church every day and visited with friends, so life in a new land can seem lonely. In El Cajon, they attend early morning Mass, then spend several hours at local senior adult day care centers. It takes a while for the community to accept a journalist who is clearly not one of their own. I found that greeting them with the traditional “Shlama,” (“Peace”) and mentioning the name of Father Felix opened more than a few doors. One woman didn’t want to share her name with me or be photographed, but after I spent two hours sitting with her and four generations of her family, the evening ended with hugs and kisses all around. Her son — who was only an infant in her arms when his father was killed — will be a student in my First Communion class at Holy Cross Chaldean Mission in Gilbert, Arizona this year. Angel Mikha, who teaches alongside me, is frequently mistaken for my sister. But it isn’t a mistake, not really. Over the last five years, we’ve become sisters in Christ as this community has adopted me, a Latin rite Catholic, strengthening my own faith with their heroic witness and hearty hospitality. It’s a journey that’s still unfolding and one that inspires me daily to try to follow Christ more sincerely. 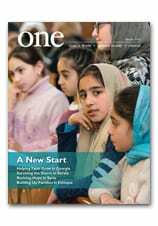 Read more in “Nineveh, U.S.A.” in the current edition of ONE. "Others Will be Attracted by His Light"
Sister Liza Mundamattom, of the Deen Bandhu Samaj Sisters, greets a member of the Chamba Mahara caste in Bastar, India. The Vatican’s Year of Consecrated Life officially came to a close today. To read about some of the sisters we have profiled since the year began, visit this link. And to support the formation of more sisters around the world, visit this giving page. Pope Francis has called on consecrated men and women to make courageous and prophetic choices, to not be afraid of getting their hands dirty and of walking the geographical and existential peripheries of mankind today. The Pope was speaking to consecrated men and women during Mass in St. Peter’s Basilica marking the end of the Year of Consecrated Life. The Year, which was celebrated throughout the world, began on the First Sunday of Advent in November 2014 and came to a close on the World Day of Consecrated Life on 2 February, 2016. You can read the pope’s homily here. Is This the Oldest Image of Mary? that may portray the Virgin Mary. Is it possible that a painting from a building excavated in 1932 and publicized around the world has not been correctly identified? ...While the Samaritan Woman at the Well was a respected biblical figure for early Christians, there was actually a more prominent “woman at the well” in Syria: the Virgin Mary during the Annunciation, when an angelic visitor informed her of her miraculous pregnancy. Where does this episode take place? The setting of the canonical account, in the Gospel of Luke, is not specified. But the second-century biography of Mary’s early life, usually called the Protevangelium of James, describes how one day, during a break from her work, “she took the pitcher and went forth to draw water, and behold, a voice said: ‘Hail, you are highly favored, the Lord is with you, blessed are you among women.’ And she looked around on the right and on the left to see from where this voice could have come.” During this first encounter, at a well or spring, the angel was heard but not seen. Mary appeared to be alone. Archival photographs and drawings made by the archaeologists on site show that the supposed absence behind the female figure is not totally silent — it speaks a couple of lines. That is to say, a field sketch of the wall done “to show additional details” depicts two painted lines touching the woman’s back, along with a kind of starburst on the front of her torso, features described as “unexplained” in the archaeological report. But with the new interpretation of the figure, in connection with the Eastern iconography that came later, the lines invite a rather evident meaning. They appear to represent a motion toward the woman’s body and a spark of activity within it, as if something invisible were approaching and entering her — an incarnation. If correct, this woman at a well is the oldest securely datable image of the Virgin Mary. "We All Have It. It's a Problem for All of Us." Most people have never heard a homily preached on Deuteronomy 20:10-18. It’s kind of difficult to apply these God-given rules of war to daily life in the 21st century. The New York priest has spent a lifetime reading, translating and understanding the ancient languages which, once mastered, gave him insights into the Bible and the monotheistic cultures of the three Abrahamic religions. He’s been a contributor to Muslim-Christian dialogue since 1985, and he is the author of “Islam: What Catholics Need to Know.” He also serves as external affairs officer of Catholic Near East Welfare Association. Villagers climb on top of a crowded Jeep after their weekly shopping in an Indian village in the so-called “Red Valley.” To learn how a group of devoted sisters is helping the poor in this conflict-stricken corner of the country, read Serving in the Red in the Summer 2015 edition of ONE.